Tough lost last night. Hopefully we can win the next 2 and take the series. 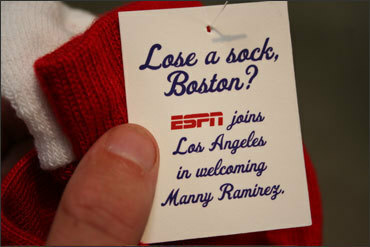 Manny Ramirez is a tonic for L.A. ESPN gives a Red Sock to nearly all the Laundromats in L.A. county. Hey Manny, time to update your website. T.J. Simers of the L.A. Times has article of Juan being Juan. Is Manny cutting the dreads ? Manny may learn from Kobe. Brad Penny says he’s ready to go.